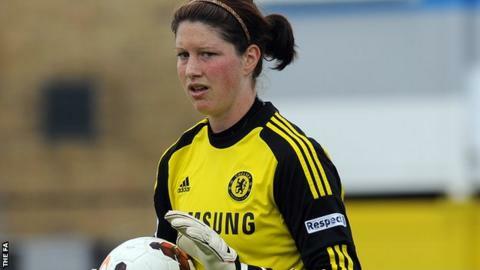 Manchester City Women have signed Chelsea Ladies' former England Under-23 goalkeeper Marie Hourihan. The 26-year-old, who helped Chelsea pip City to this year's WSL 1 title, had been with the club since July 2013. She started six matches for Chelsea this year as Sweden's Hedvig Lindahl became Chelsea's first-choice keeper. "It's a brilliant opportunity - one I couldn't turn down - and I'm thankful to Chelsea for letting me take the opportunity," said Hourihan. "The massive progression the club has made in the last two years and the infrastructure that's in place is second to none," she added to the Manchester City website. Hourihan will again be battling for the number one jersey with an established international, this time England's Karen Bardsley. "At Chelsea, I was playing with the Swedish record caps holder so I'm ready for the challenge," said Hourihan. "I'm looking forward to training with Karen - I can only learn from her and we can help each other and improve each other. "For me, it's a step in the right direction. Year on year, this football club is progressing and I feel it's the best environment."